The more I reflect on caregiving, the more humble I feel. Caring for others is a very complicated and confounding business – it’s a double-edged sword that’s chock full of paradox and ambivalent feelings. “Living in the Land of Limbo” is a collection of fiction and poetry about family caregiving that reveals poignant, enraging and gentle truths about giving and receiving care. It was edited by Carol Levine and published by the Vanderbilt University Press in 2014. I adored this book, and I think you will too. “According to early Christian theologians, “limbo,” where innocent souls wander, lies at the border of Hell. Its theological history aside, limbo today means a state of uncertainty, a feeling of being trapped, waiting for events beyond one’s control to unfold.” Every caregiver I know can put a stake in Limbo and claim it as home. Levine has located the best stories and poems about all sorts of caregivers. For flow and navigation, she’s separated the work into these chapters: Children of Aging Parents, Husbands and Wives, Parents and Sick Children followed by Relatives, Lovers and Friends, and finally Paid Caregivers. I recognized myself in every single chapter. Sometimes, the beauty of the prose nearly knocked me down: “…and then to find each other in our frailty when all else is lost – all earthly things have lost meaning and importance.” Those words by Mary Gordon in her story, “Mrs. Cassidy’s Last Year”, reminded me of the transcendence of long term caregiving – of being aware of having relocated to a parallel universe in which time has slowed and the only thing that matters is each other. What matters is each other, but the loved one’s illness or condition is ever present, too. (From a story about spousal care called Thoreau’s Laundry by Ann Harleman). “Sitting there, bowed and bobbing, the Mother feels the entirety of her love as worry and heartbreak. A quick and irrevocable alchemy: there is no longer one unworried scrap left for happiness.” There is so much here that will be intensely familiar to anyone who has been suddenly thrust into caregiving. I know my own mother felt this way the day after my father’s stroke. 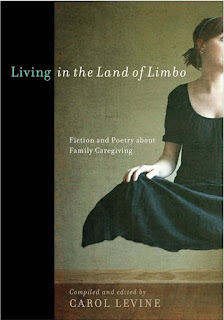 Carol Levine has chosen stories and poems that help us to understand that caregiving is like Limbo, yes, but in this otherworldly place, we are as close to one another as humans can ever become. This is a place in which the future is out of our control, so we cling to each other, relaxing eventually and allowing our breathing to align. In this ‘Limbo’, there is desperate struggle, but there is comfort and love, too.